he was the eighth child born to District Elder Avery Dumas Jr.
many major corporations such as; General Motors, Ford Motor Company, Daimler Chrysler Corporation and Saturn Corporation. On March 31, 2001 he was installed as Pastor of New Grace Apostolic Temple by Bishop Harry L. Herman, Diocesan Bishop of the 5th Episcopal District of the Pentecostal Assemblies of the World. His installation service took place just one day before the passing of his father, mentor, and best friend, District Elder Avery Dumas Jr. Standing on the shoulders of his father, mentor, and best friend, Suffragan Bishop Dumas has taken the New Grace family to higher heights with 200+ souls being saved under his leadership. 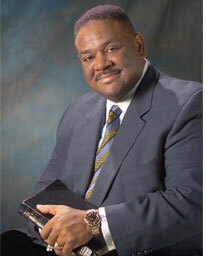 Suffragan Bishop Dumas is an ordained minister by the Pentecostal Assemblies of the World. He continues his studies at Aenon Bible College where he completed and earned his Pastoral Ordination and seeks further religious studies. Suffragan Bishop Dumas was married to our First Lady Rosalind Lee Dumas in June of 1986. God has blessed this union with three lovely and articulate children; Jennifer Lee, Madison Elyse, and last but certainly not least, nicknamed by his mother “mister surprise” Avery Dumas IV. First Lady Rosalind and Suffragan Bishop Dumas work full time in the ministry at New Grace Apostolic Temple and are raising their children in the fear and admonition of the Lord. Suffragan Bishop Dumas is a devoted husband and father and always stresses the importance of taking time to spend with his family. Suffragan Bishop Dumas is a youthful and dynamic man of God who preaches and teaches the Apostolic Doctrine with conviction. It was in his Grandfather, his father District Elder Avery Dumas Jr. and we believe, it’s also in him.